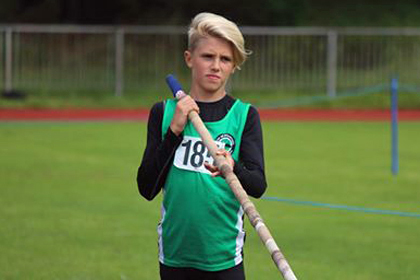 CITY of Plymouth’s Noah Jones has moved in the UK’s all-time top 10 for the under-13 pole vault after setting a new personal best at the last Exeter Evening Open Meeting of the season. Jones won the event with a leap of 2.75m, which was a massive 15cm better than his previous competition best. It puts him second in this year’s UK rankings and ninth on the all-time list. It has been a good week for the Plymouth youngster as he also set new PBs in the pentathlon, long jump, high jump, shot and 800m at the Exeter Combined Events Meet last Sunday. He will end his track season – his last at under-13 level – at the Cornwall AC Jumps Festival this weekend. Jones, though, was not the only athlete to set a new PB at the Exeter Evening Open Meet. There were also new best marks for Erme Valley athletes Adam Dingley and Liam Hallows and Tavistock youngsters Joe Wheeler and Nicolas Maczugowski. Dingley’s PB came in the under-11 75m, where he clocked a time of 11.25 seconds to finish second. He also leaped 3.73m in the long jump and threw 3.87m in the shot. Under-20 athlete Hallows set his new best in the senior 3,000m, clocking 10.25.89. Wheeler ran 13.02 seconds on his way to being the fastest under-13 athlete over 100m, while under-11 team-mate Maczugowski set two new PBs – 5:41.51 for the 1,500m and 1.30m for the high jump. Fellow Tavistock athletes Ben Rogers and Edward Fileman also impressed at Exeter Arena. Fileman came second in the under-15 discus and shot putt events. He threw 31.77m in the discus and 10.48m in the shot. Rogers was third under-17 in the long jump with 4.57m and also threw 17.25m in the javelin.